DIY E834 Tube MM phono stage amplifier kit base on EAR834 Circuit (without Tube) This edition is base on UK EAR834 (MM amplification part) design, dual independent channel, one point ground, no noise at the end. This version is MM-RIAA amplifier Gain: 1KHZ @ 48DB Each PCB Size: 100*150*1.6MM (1OZ copper, FR4 grade A PCB material) works voltage：0-260VDC above 10ma (260V-280V is ok) 0-260VDC above 10ma (260V-280V is ok) ( also can share same one Group 260V high voltage. the Current recommned above 20ma) Filament voltage： 0-12.6VDC above 0.8A Tube model: 3pcs 12AX7 ( note: the default price is not include this tubes) Note: this is a DIY kit. all the Components will need yourself to solder it. Note: This is a DIY kit, all the parts need solder by yourself. Kits not include 3pcs tubes. Mclntosh C22 tube preamp, dynamic very sharp, a few gallbladder in front of a dynamic stone works. The board reference Mclntosh C22 circuit, designed with dual single stand-alone design, physically left and right channels 100% separation, independent grading ground. PCB size: 100 * 150 * 1.6MM, spray tin process Materials used: Taiwan production of colored metal ring resistors 1% accuracy MKP coupling capacitor Ceramic tube seat Input voltage: DC-280V two groups, each group is not less than 10MA DC12.6V one group, not less than 0.8A (for filament) Recommend the use of electronic tube: 12AX7 and its compatible tube (excluding Tubes). This kit is a transistor resistor pcb parts kit! 12AX7 / 2 个, 6dj8 / 1 个 (bile and power cattle are not included in the price of this product). This product is for electronic technology and testing capabilities of users to buy. Note: This is DIY Kits, Need welding its by yourself! Not included 12AX7 / 21AU7 Tube! Power Supply: DC 180-300V DC 12V Using double-sided immersion gold processes Taiwan produced copper foot precision metal film resistors! Siemens high-voltage filter capacitor! Ceramic Gold-plated tube socket to ensure contact reliability! The circuit has a noise inaudible! The tube preamp circuit, because of its second harmonic distortion appropriate, connected to the power amplifier board with more bile performance! Sound performance rounded. 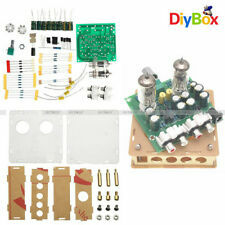 6Z4 12AU7 12AX7 Tube preamplifier board Reference Marantz 7 classical circuit DIY HIFI Kits This is DIY KIT, you need to solder it by yourself. Without 12AU7*2 12AX7*2 Tubes , please Note. Parameters: PCB Size: 155mmx121mm Features: * Imitated from the famous Marantz 7 (Marantz) classic circuit. * PCB is double-sided gold plated, resistance Beijing 718 is coupled to Germany Siemens or ERO * Three Main 4 tubes can use 12AU7*4/ 12AX7*4/ 12AU7*2 12AX7*2 / Russian EH series (Not contain 4pcs main tubes) . * High voltage part with 6Z4*2 tube rectifier. * Gold plated tube holder * Transformer requirements AC 240V--0 6V--0 12V--0 (high voltage range can be 200-260V). 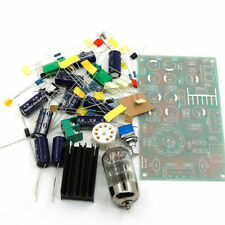 PRT-03A Hifi Stereo Tube preamp kit (base on the famous C22 preamplifier) HV Power supply kit (The link is for DIY kit. all the parts will need youself to solder it) Sound features: dynamic sharp / low frequency with elasticity / sound field width / three fields are balanced. Preamp board Works voltage: DC280V (above 10ma ) X 2 groups and DC12.6V ( above 0.8A) Power supply board input voltage: 0-AC220V X 2 (200V-240V are ok) 0-AC12V X 1 (12-15V are ok) Preamp PCB Size: 150*100*1.6MM PSU PCB Size: 130*70*1.6MM Taiwan metal film resistance 1% accuracy MKP coupling capacitor Ceramic tube socket. This board can using 3pcs 12AX7 or some other same type tubes (12AXX series are all ok). 2018 Ver RIAA MM Tube phono stage amplifier kit -------base on UK EAR834 (MM amplification part) design This version has Optimized layout. also has integrated the Power supply circuit, it is more easy to built a hi-end phono stage amplifier. PCB Size: 205*153*1.6MM (1OZ copper, Gold plated FR4 grade A PCB material) Works voltage: High voltage 0-AC260V >16mA Filament 0-AC14V >1A Tube model: 3pcs 12AX7 ( note: the default price is not include this tubes) Two independent channel, one point ground, no noise at the end. This version is MM-RIAA amplifier Gain: 1KHZ @ 48DB Note: this is a DIY kit. all the Components will need yourself to solder it. We can provide the BOM and schematic via email. Nobsound®——Douk Audio. HiFi Art-Elfidelity. 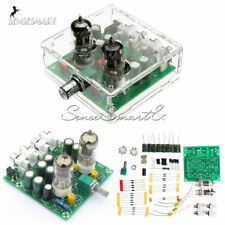 Latest Tube Pre-AMP amplifier DIY KIT for Audio Hifi 6Z5P 12AX7B Ref Marantz 7. Hi-Fi Tube Amplifier. Integrated Amplifier. Digital Amplifier. Audio HiFi & DIY. 6N3/5670 Tube preamplifier board Reference Matisse preamp circuit DIY HIFI Kits This is DIY KIT, you need to solder it by yourself. with Taiwan potentiometer and 6N3 *2 Tubes , please Note. Parameters: PCB Size: 132mmx99mm Features: * The new 6N3 tube * 2, can be replaced with the US 5670. * Potentiometer compatible with ALPS16 and ALPS27 potentiometers (default Taiwan potentiometer) * Coupling is the new WIMA and Swedish EVOX * Resistance is the United States DALE * Filament voltage is LM317 regulator into 6V. * Gold plated tube holder * The main capacitor is disassembled BC 1500UF * 10 times the circuit amplification, you can reduce the value of 22K * Transformer requirements 60VX1 9VX1 (with error), 60V current 100MA-200MA can, 8v. This is DIY KIT,you need to solder it by yourself, no potentiometers and tubes. (if you need, pls contact me.) Single-ended amplifier has a very strong sense of music, output resistance is also lower than other circuits, can drive headphones in the range of 32-600ohm. The sense of control and the extension are better than the stone machine. Because the filament and the high pressure in the setting are both DC stabilized, the signal-to-noise ratio is very high, which is more tranquil than ordinary stone machines. Power supply : AC 140V AC 6V. HiFi Art-Elfidelity. Phono Pre-Amplifier. 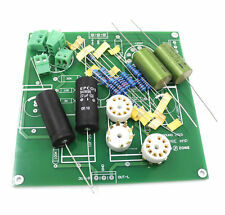 Phono diy KIT (PCB resistance transistor) For HIFI. Audio HiFi & DIY. This board need you have electronic technology and detectability,it's special designed for Hi-End HiFi Audiophile. Other people diy picture. (Using the tube type 12ax7 three). Koa optical for the kondo (audionote) M7 original machine using resistors. The use of the tube model. 6x4 / ez90 a 12ay7 / 6072wa4. AC6.3V2A 12.6V3A 230-0-230V100MA. diy kit，picture is soldering， Contains all parts of the main image. Note:picture is finish product,this product is diy kit. Resistance for the Japanese koa optical Dani United States irc. Note: this is a kit, need yourself to soder all the components. Not contain tubes. The PRT05A refers to the Conrad-johnson CL circuit. The design uses a dual-single-independent design. It physically separates 100% of the left and right channels and is grounded independently. PCB size: 144*178*1.6MM, spray tin process Recommend works voltage: High voltage: 0-AC220V 0-AC220V (above 10MA) Filament voltage: 0-AC6.3V (above 1A ) 0-AC6.3V (above 1A ) The High voltage AC200V-250V is ok , Filament voltage (AC6V-7V is ok) Note: the default price is not include the tubes. This board can works with following tubes: 12AX7、12AU7、12AT7. 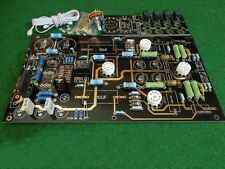 PRT-07A Hifi Stereo Tube preamp kit (base on the famous Marantz 7 preamplifier) HV Power supply kit (The link is for DIY kit. all the parts will need youself to solder it) Designed with dual independent design, physical left and right channels 100% separation, independent grading ground. Preamp board Works voltage: DC280V (above 10ma ) X 2 groups and DC12.6V ( above 0.8A) Power supply board input voltage: 0-AC220V X 2 (200V-240V are ok) 0-AC12V X 1 (12-15V are ok) Preamp PCB Size: 154*77*1.6MM PSU PCB Size: 130*70*1.6MM Taiwan metal film resistance 1% accuracy MKP coupling capacitor Ceramic tube socket. This board can using 3pcs 12AX7 or some other same type tubes (12AXX series are all ok). This is DIY Kit, not assembled. Not contain Tubes. We can provide the PDF schematic. PRT-07B preamp is reference the famous Marantz M7 preamp Circuit , The sound quality is mellow, the medium frequency is sweet and natural. tube tastes very strong. PCB size: 152*177*1.6MM FR4 Works voltage: 200-220V AC >=15mA , 12-14V AC >=0.8A This preamp are using 3pcs 12AX7 Tubes. (note the kit defalut are not include the tubes) Gain: about 11 times. Nobsound®——Douk Audio. HiFi Art-Elfidelity. Phono Pre-Amplifier. Hi-Fi Tube Amplifier. Integrated Amplifier. Digital Amplifier. Audio HiFi & DIY. Headphone Amplifier. Shuguang 12AX7 tubes X 3pcs. this is only a MM Phono Amplifier. can not connect with MC Phono. also can not be used as a Ordinary preamp to use it. Phono Amplifier kit X 1. Phono Amplifier kit photo. This is a DIY kit, all the parts need yourself to solder. This tube Phono Amplifier is base the famous UK EAR834 Circuit. the sound is very good. Using 3 pcs Shuguang 12AX7 tubes. Note: this is only a MM Phono Amplifier. can not connect with MC Phono. also can not be used as a Ordinary preamp to use it. Please note: Note: this is a DIY kit, all the components will need yourself to solder it. RT-02A reference to the famous classic M7 amplification circuit, DC filament power supply, high voltage band regulator and electronic filtering, direct streaking. Allowing players to spend very little cost and access to High cost-effective products. Work voltage: 0-AC(6-12V) above 1A. (when above AC9V. please note the heatsink temperature) 0-AC(200V-240V) above 10mA The gain default is about 10 times PCB size: 127X75mm (W*L) The tube hight is about 80mm ( inlcude Copper pillar size). 6N3/5670 Tube preamplifier board Reference Matisse preamp circuit DIY HIFI Kits This is DIY KIT, you need to solder it by yourself. with Taiwan potentiometer and 6N3 *2 Tubes , please Note. Parameters: PCB Size: 132mmx99mm Features: * The new 6N3 tube * 2, can be replaced with the US 5670. * Potentiometer compatible with ALPS16 and ALPS27 potentiometers (default Taiwan potentiometer) * Coupling is the new WIMA and Swedish EVOX * Resistance is the United States DALE * Filament voltage is LM317 regulator into 6V. * Gold plated tube holder * The main capacitor is disassembled BC 1500UF * 10 times the circuit amplification, you can reduce the value of 22K * Transformer requirements 60VX1 9VX1 (with error), 60V current 100MA-200MA can, 8v required a little larger current. (PRT-03A Hifi Stereo Tube preamp kit base on C22 preamplifier. preamp PCB Size: 100 150 1.6MM. （ this default price is not include tubes). Ceramic tube socket. dynamic sharp / low frequency with elasticity / sound field width / three fields are balanced. This is a preamp kit with a phono equalizer with features such as below;. Select from 100V, 115V, 200V, and 230V upon assembly. Input resistance: [MM] 50kΩ / [MC] 100Ω. SN ratio (IHF-A): [MM]108dB / [MC]88dB. Tubes used: 2pcs 6P6P, 2pcs6J4, 1pc6z5P. 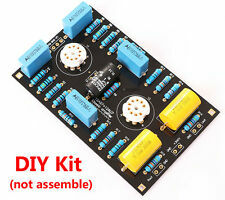 Douk Audio 6j4 6p6p Class A Tube Pre-Amplifier DIY Kit. Aluminum Chassis/DIY Enclosure. DIY Chassis / Enclosure. Hi-Fi Tube Amplifier. Audio Accessory. Nobsound®——Dou​k Audio. (two 200V can connect as DC200V 0 -DC200V). (this kit included 2pcs 200V Zener diodes. if you just need output DC200V. so just installed this one 200V Zener diodes. another one shorted. for example. ). Please note: Note: this is a DIY kit, all the components will need yourself to solder it. RT-02A reference to the famous machine's classic AN M7 amplification circuit. Allowing players to spend very little cost and access to High cost-effective products, DC filament power supply, high voltage band regulator and electronic filtering, direct streaking. Allowing players to spend very little cost and access to High cost-effective products. Work voltage: 0-AC(6-12V) above 1A. (when above AC9V. please note the heatsink temperature) 0-AC(200V-240V) above 10mA The gain default is about 10 times PCB size: 127X75mm (W*L) The tube hight is about 80mm ( inlcude Copper pillar size). 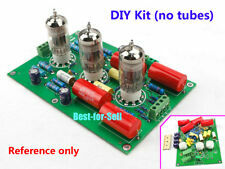 DIY hifi 6J1 tube preamp kit / Vacuum tubes preamplifier kit. This preamp boar using beijing 6J1 tube, classic transistor amplifier circuit, work in class A, more easily to mach with the power amplifier, almost any amplifier line can be satisfied with the results. Note: This item does not include two tubes (output coupling capacitor random shipments, Images by reference) "X10-D" music fax preamp gall buffer plate indicators: Distortion: 0.008% (10Hz ~ 100KHz) Frequency Response: 10Hz ~ 100KHz (± 0.2db) Output Impedance: 200Ω, Tubes can be used 2pcs 6DJ8,6922, or 6N11, dual 12V -30V DC power supply through the machine inside. Signal 1: 1 buffer. Basic Specifications: PCB Size: 10.0 × 10.0cm (military Immersion Gold) Process: KB-level military board high-precision CNC machining Sheet thickness and specifications: 1.6mm KB Kingboard A grade FR4 board Power Description: Dual 12V-30V DC power supply! Recommend the use of power supply, such as LM317.337. Filament need 12-12.6V power, this power can be used independent of 12V, 12V filament can.